Download "Galena Park Independent School District Wellness Policy"
1 Galena Park Independent School District Wellness Policy Federal Public Law (PL Section 204) states that by the first day of the 2006 school year, beginning after June 30, 2006, all schools must develop and implement a local wellness policy that involves parents, students, a representative from the School Fund Authority, school board, school administrators. 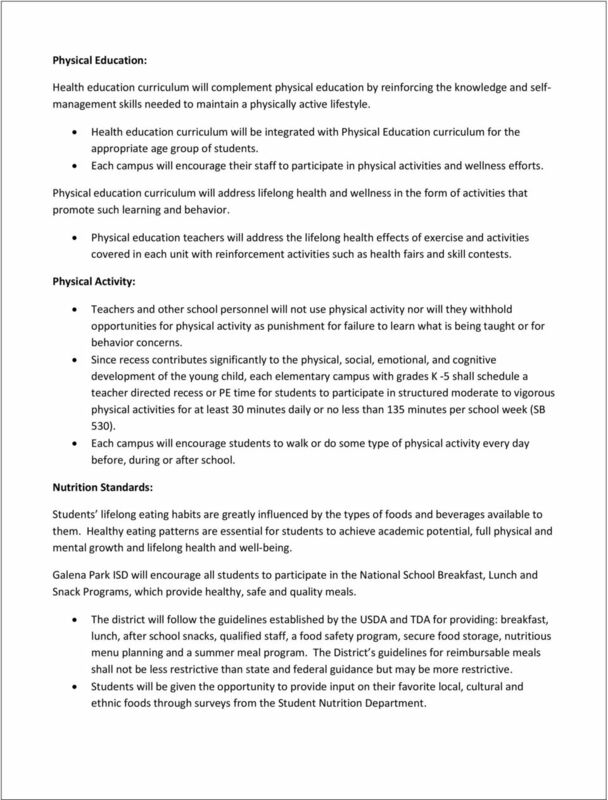 Mission Statement: Galena Park ISD implements a comprehensive wellness plan that encourages healthy eating and physical activity in order to reduce childhood obesity and to prepare students to become healthy citizens and lifelong learners. Nutrition Education: Galena Park ISD will integrate nutrition education into health and physical education curriculum programs. Health and wellness information will be shared with faculty, staff, students and parents. Campuses will provide faculty and staff with information regarding district policy and continuing education about nutrition and wellness. Campuses will provide continuing education about nutrition and wellness for students and parents. Students in Pre-Kindergarten through grade 12 will receive nutrition education that will encourage them to adopt healthy eating habits and lifestyles. Each campus will incorporate weekly nutrition and health tips for all students. Nutrition education will be encouraged in the cafeteria and in the classroom through a variety of activities. All K-8 campuses will implement the approved coordinated school health program CATCH, as required by law. All campus personnel involved in implementing the coordinated school health program will receive necessary training as required. Each campus Wellness Committee will oversee implementation and evaluation of their Campus Wellness Plan. 2 Physical Education: Health education curriculum will complement physical education by reinforcing the knowledge and selfmanagement skills needed to maintain a physically active lifestyle. Health education curriculum will be integrated with Physical Education curriculum for the appropriate age group of students. Each campus will encourage their staff to participate in physical activities and wellness efforts. Physical education curriculum will address lifelong health and wellness in the form of activities that promote such learning and behavior. Physical education teachers will address the lifelong health effects of exercise and activities covered in each unit with reinforcement activities such as health fairs and skill contests. Physical Activity: Teachers and other school personnel will not use physical activity nor will they withhold opportunities for physical activity as punishment for failure to learn what is being taught or for behavior concerns. Since recess contributes significantly to the physical, social, emotional, and cognitive development of the young child, each elementary campus with grades K -5 shall schedule a teacher directed recess or PE time for students to participate in structured moderate to vigorous physical activities for at least 30 minutes daily or no less than 135 minutes per school week (SB 530). Each campus will encourage students to walk or do some type of physical activity every day before, during or after school. Nutrition Standards: Students lifelong eating habits are greatly influenced by the types of foods and beverages available to them. Healthy eating patterns are essential for students to achieve academic potential, full physical and mental growth and lifelong health and well-being. Galena Park ISD will encourage all students to participate in the National School Breakfast, Lunch and Snack Programs, which provide healthy, safe and quality meals. The district will follow the guidelines established by the USDA and TDA for providing: breakfast, lunch, after school snacks, qualified staff, a food safety program, secure food storage, nutritious menu planning and a summer meal program. The District s guidelines for reimbursable meals shall not be less restrictive than state and federal guidance but may be more restrictive. Students will be given the opportunity to provide input on their favorite local, cultural and ethnic foods through surveys from the Student Nutrition Department. 3 School personnel, along with parents, will encourage students to choose and consume full meals. Positive nutrition messages will be communicated to students through action as well as words on a regular basis. 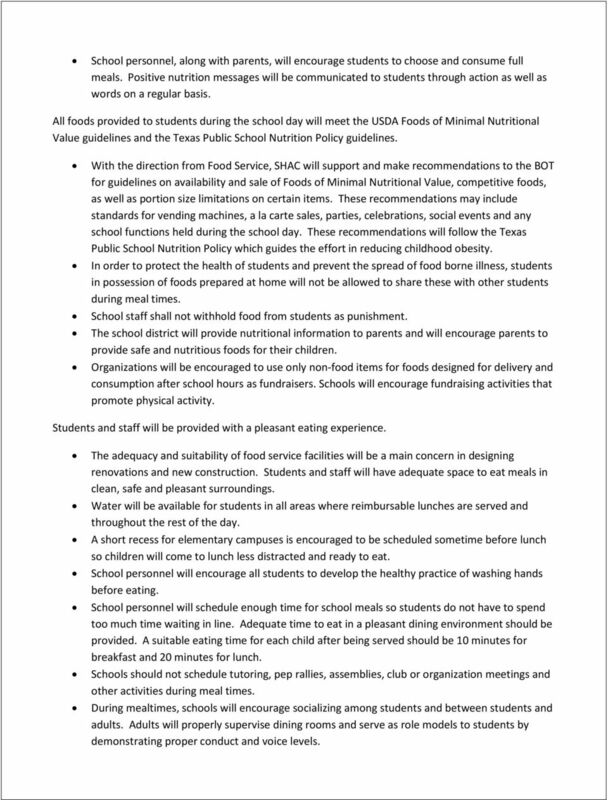 All foods provided to students during the school day will meet the USDA Foods of Minimal Nutritional Value guidelines and the Texas Public School Nutrition Policy guidelines. With the direction from Food Service, SHAC will support and make recommendations to the BOT for guidelines on availability and sale of Foods of Minimal Nutritional Value, competitive foods, as well as portion size limitations on certain items. These recommendations may include standards for vending machines, a la carte sales, parties, celebrations, social events and any school functions held during the school day. These recommendations will follow the Texas Public School Nutrition Policy which guides the effort in reducing childhood obesity. In order to protect the health of students and prevent the spread of food borne illness, students in possession of foods prepared at home will not be allowed to share these with other students during meal times. School staff shall not withhold food from students as punishment. The school district will provide nutritional information to parents and will encourage parents to provide safe and nutritious foods for their children. Organizations will be encouraged to use only non-food items for foods designed for delivery and consumption after school hours as fundraisers. Schools will encourage fundraising activities that promote physical activity. Students and staff will be provided with a pleasant eating experience. The adequacy and suitability of food service facilities will be a main concern in designing renovations and new construction. Students and staff will have adequate space to eat meals in clean, safe and pleasant surroundings. Water will be available for students in all areas where reimbursable lunches are served and throughout the rest of the day. A short recess for elementary campuses is encouraged to be scheduled sometime before lunch so children will come to lunch less distracted and ready to eat. School personnel will encourage all students to develop the healthy practice of washing hands before eating. School personnel will schedule enough time for school meals so students do not have to spend too much time waiting in line. Adequate time to eat in a pleasant dining environment should be provided. A suitable eating time for each child after being served should be 10 minutes for breakfast and 20 minutes for lunch. Schools should not schedule tutoring, pep rallies, assemblies, club or organization meetings and other activities during meal times. During mealtimes, schools will encourage socializing among students and between students and adults. Adults will properly supervise dining rooms and serve as role models to students by demonstrating proper conduct and voice levels. 4 Creative, innovative methods will be used to keep noise levels appropriate. The school environment should provide a consistent wellness message to students and staff. School-based marketing of food products will be consistent with nutrition education and health goals expressed in this policy. Parent Involvement Goals: Parents are the first and most important teacher in a child s life; therefore, parent involvement is a key component in achieving good eating habits and exercise. These habits directly influence students academic success and attendance. Educate parents on the health and physical concerns facing their children. All parents will be given information periodically on suggestions for improving nutrition and physical activity at home. Provide parent involvement meeting that informs parents on ways to improve family nutrition and physical activity as it relates to the home. Collaborate with PTA to assist with improving communication with parents on health and wellness concerns. 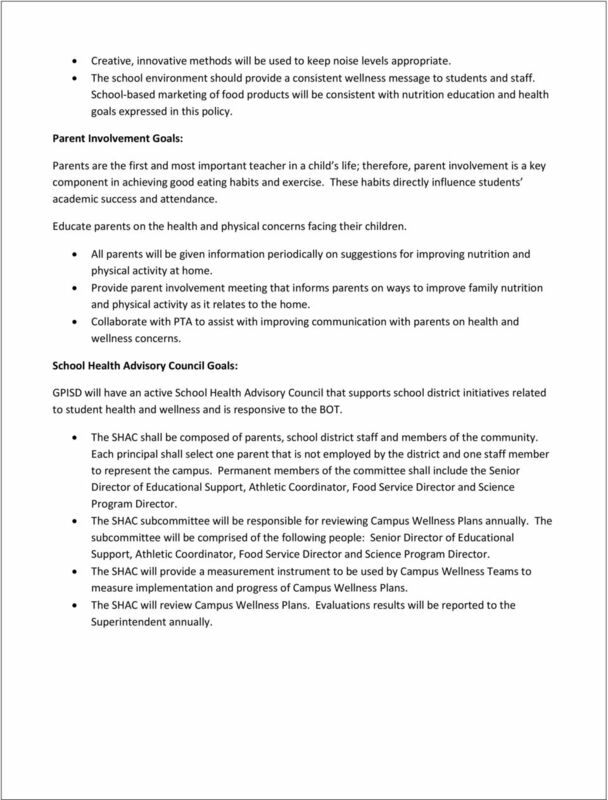 School Health Advisory Council Goals: GPISD will have an active School Health Advisory Council that supports school district initiatives related to student health and wellness and is responsive to the BOT. The SHAC shall be composed of parents, school district staff and members of the community. Each principal shall select one parent that is not employed by the district and one staff member to represent the campus. Permanent members of the committee shall include the Senior Director of Educational Support, Athletic Coordinator, Food Service Director and Science Program Director. 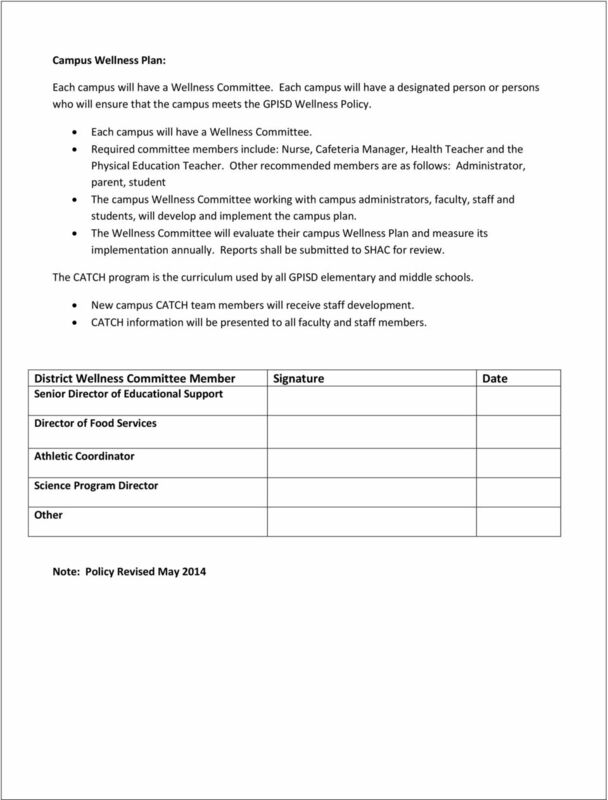 The SHAC subcommittee will be responsible for reviewing Campus Wellness Plans annually. The subcommittee will be comprised of the following people: Senior Director of Educational Support, Athletic Coordinator, Food Service Director and Science Program Director. The SHAC will provide a measurement instrument to be used by Campus Wellness Teams to measure implementation and progress of Campus Wellness Plans. 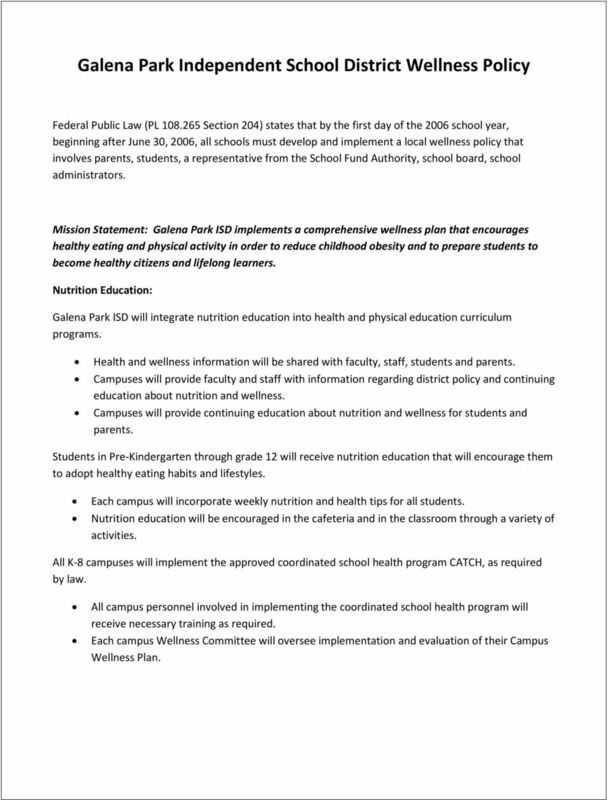 The SHAC will review Campus Wellness Plans. Evaluations results will be reported to the Superintendent annually. Beverages Beverages that contain at least 25% fruit juice with no added sweeteners. Water Milk, Low-Fat (1%), Non-Fat milk, milk alternatives. SHAC 101: STARTING A SCHOOL HEALTH ADVISORY COUNCIL. It s Never Too Late and there is always room for improvement! Executive Summary. school years. Local Wellness Policies: Assessing School District Strategies for Improving Children s Health. Couch potato in-training? It s time to get serious about health: for our kids and our schools. Set Go!